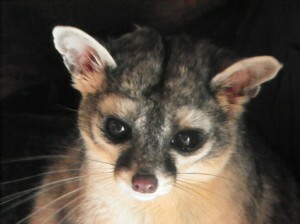 (Bassariscus astutus) Ringtails were kept as pets by miners in Big Bear during the gold rush era. Ringtails are omnivores but seem to prefer meat. They eat mice, birds, insects, eggs, fruits and vegetation. The oldest Ringtail on record in captivity was 16 years old. How many babies do they have? They can have between one and four babies, but two is common. Ringtails are found from Oregon down through Northern Mexico on the west coast and east through Texas and Oklahoma. Ringtails are sometimes called Ringtail cats but they are not felines. Ringtails were kept as pets by miners in Big Bear during the gold rush era. Ringtails are excellent climbers and can maneuver cliffs and ledges by ricocheting off of walls. They can also climb small crevices by “chimney stemming” (four feet on one wall, back against the other) and can rotate their hind feet 180 degrees. Luna – a female, came from Arizona in 2011. Her mother was removed from a business by animal control and Luna was found in a wall a day later. She was very young and she imprinted on humans, so she cannot be released back to the wild.